Which animals store food for the winter? How do animals remember where they stored their food? Have you ever noticed that you don't see any animals shopping at grocery stores? When you want peanuts, you go to the store. When squirrels want nuts, they shop in trees. Shopping at grocery stores is convenient for us. They always have a wide selection of different kinds of food to eat. They also are open year-round. When winter rolls around, you don't have to store up plenty of food to eat when it's cold outside. You just keep going to the store when you need more food. For many animals, though, the “store" isn't open year-round. For example, many plants and trees only produce edible products like fruit and nuts at certain times of the year. If animals are going to have enough food to survive the winter, they often need to set aside some for later. One animal you may have seen storing nuts for the winter is the squirrel. That's why some people call storing up food for the winter “squirreling" food away. Not all squirrels store food in the same way, though. Gray and Fox Squirrels, for example, hide their food by burying it in many different places underground. Scientists call this “scatter hoarding." Why do they do this? It's actually a smart thing to do! If another animal finds a store of food and eats it, the squirrel will still have many other stores of food and won't go hungry. 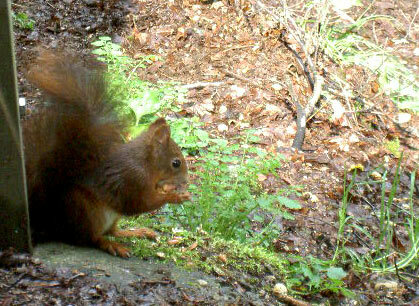 Red and Pine Squirrels, on the other hand, hide their food in piles. They dig shallow pits — called middens — and cover them with leaves or other ground cover. Scientists call this “larder hoarding." Squirrels aren't the only animals that store up food for the winter. Wildcats often bury small prey, such as birds. Moles store up earthworms in mounds. Foxes might store eggs or bones in shallow holes. Mice scatter hoard seeds and nuts in underground nests. When squirrels and other animals scatter hoard food for the winter, how do they know where to find it again? Some experts believe they don't necessarily remember where they hid food. Instead, they just use their sense of smell to sniff out buried food. Others believe animals do remember where they bury food. Animals might use landmarks, such as trees and plants, to help them remember where they've stored food. Some squirrels even get tricky with their food hiding. Scientists have learned that some squirrels bury fake nuts. To fool other animals, they dig holes but bury nothing in them. They just pretend in order to make other animals think something is buried there! Tomorrow’s Wonder of the Day is a shoe-in to please horse lovers everywhere! Think about the foods you eat on a daily basis. Now imagine that you just learned that all local grocery stores were going to close for three months in just a few days. What would you do? How would you decide which foods to stock up on? Where would you put all of the food? Can you think of any situation that might actually occur in the future that could require you to store up food for an unknown period of time? How would you handle such a situation? If you have trees in your backyard, spend some time out there today. If not, find a nearby wooded area you could walk to and enjoy for a bit. Think about the squirrels that live in the trees. If you were a squirrel and had to gather nuts to keep for winter, where would you store them? Look around at the possibilities. Would you recommend scatter hoarding or larder hoarding? What are the benefits and drawbacks of each? Share your thoughts with a friend or family member. Do they agree with your ideas? Even though we don't have to squirrel away food for the winter, people do set aside certain things for the future. One of the most important things we store ahead for the future is money. If you think ahead, we're sure you can think of all sorts of things you'll need money for one day: new clothes and shoes, a bicycle, a car, and even college! Starting a savings account early also allows you to make the most out of compound interest from the bank. So start setting some money aside and let your money multiply and grow on its own as you add to it over the years. For more information about saving money, check out the Project C.H.A.N.G.E. Dreaming Big website to learn more about planning for the future. was that really a ghost. We're not sure, London. What do YOU think? I love Squirrels, that is why I picked it I love the video it was so cute. We're glad you liked this Wonder, Summer! We think the video is cute, too! We're glad you liked this Wonder, John! What was your favorite thing that you learned? What would happen if a squirrel gets injured? Would it die or would it heal up and be better? Hi, Drew! That would depend on the squirrel's doctor! there was no talking so i didnt really learn anything. Hi, alex! Did you know that you can listen to the Wonders of the day while you read along? We hope this helps! Would they? They are so jumpy. Pretty cute, though. I loved this WONDER! I learned SO much!! I LOVE SQUIRRELS.Did the red squirrel really invent maple syrup? I think its cool how the squirrels trick other animals were their food is. What I learned is not all squirrels store there food. I think it's cool how the squirrels scatter the food so other animals don't find it. Our class was wondering this after reading this Wonder...Why would squirrels bury their food instead of storing it in their habitat? I read somewhere that squirrels do not actually remember where they keep they're nuts and sometimes just leave them because they forget. We wonder why squirrels eat nuts? Why can't they eat human food? Another thing we learned is that animals have stores like we do in their trees and holes. Then another thing we learned is that squirrels hide fake nuts so if another animal tries to take some nuts they take the fake ones. We loved the video above! We want to know what the people in the video were shaking to make the squirrel come back to the nut? We learned all about how squirrels gather nuts for winter and enjoyed watching the squirrel crack the nut. Thank you! I thought the article was very interesting. I learned many things that I didn't know before reading this article. One thing I wished would have been done in the article was to talk about the squirrel and explain what he was doing. I think the movie was amazing and an interesting film. Thank you for always making me learn something new and interesting every day Wonderopolis! I love it. I am even working on it at school. I love squirrels. They are cool and so cute. I want to have a a squirrels. Omg I love squirrels... they are so cute! Hi, this is Haley from Mrs. Caplin's class! I learned a lot of new facts including gray and fox squirrels bury their food in many different places underground, red and pine squirrels hide their food in piles, and some scientists believe some squirrels don't remember where they put their food but others believe they use landmarks such as a tree or plant to help them remember where they stored their food. But the new fact that was very surprising is some squirrels bury fake nuts to fool other animals! I have a very strange connection to this wonder. It is my family used to raise a real squirrel. His family fell out of their nest on our tree and he was a baby [he still had his eyes closed] and his mother took all the other babies but not him and she never came back for him. My brother Kyle picked a random name which was Pickle, and the name stuck. He grew bigger and was not afraid to climb on us. Before winter we had to let him go because he needed to hibernate and he was getting to be a very wild squirrel. It was an interesting experience to own one, though. I have one question is there a difference between female and male squirrel size? I learned a lot! Thanks for the phenomenal wonder! Hello, I'm James from Mrs. Caplin's class. I thought that this wonder was so amazing and interesting. I learned that some squirrels hide their nuts in different places. In the try it out, I knew that I have a savings account and so do my parents for my college. I didn't know what larder hoarding meant, but I used context clues to infer that it meant hiding in large amounts. A little while ago, I saw a squirrel with a nut and I thought he was burying it for winter. I think that tomorrow's wonder of the day will be about Martin Luther King Jr.'s speech in Washington D.C.
What do some people call storing up food for winter? What type of hoarding occurs when animals store food in many different places underground? What kind of hoarding occurs when animals hide all their food in a single pile, such as a hole in the ground?